It’s been a long time since I last modified a truck with photoshop. Having a Moebius 1/25 scale model kit of the International Lonestar truck, I wondered how it might look without the tall sleeper cab before starting to build the kit. Starting up the graphics software and modifying the roof was easy enough… but once again my mind accelerated on it’s own and not too long after, the 2009 Harley-Davidson Special Edition was lowered, had bigger diameter wheels with low profile tires and many small improvements were done. Imagine a color-matched flatbed trailer behind it. 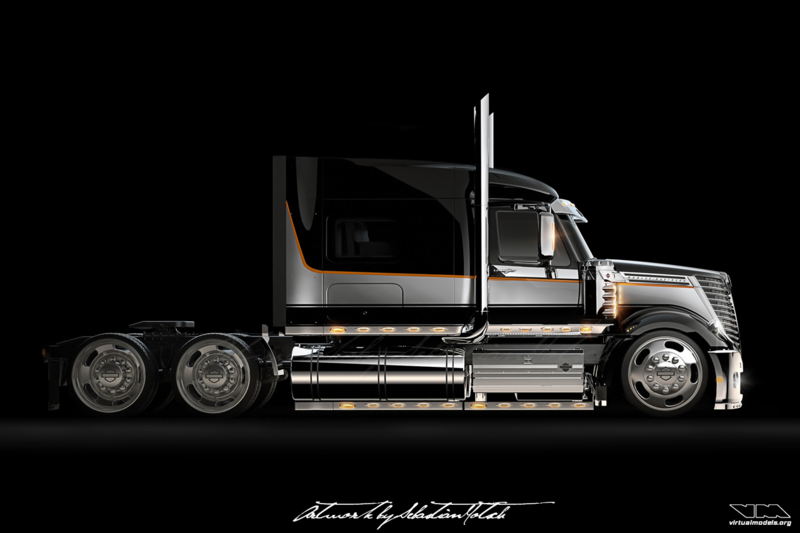 Would be an awesome rig to haul freight with and display it at truck shows, wouldn’t it? Click here to see the original image.